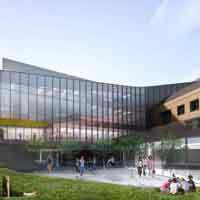 A rendering of the exterior of the Interdisciplinary Science Building. A “Furniture Fair,” an event where the Webster University community will be able to offer feedback on the furniture being considered for the ISB, has been scheduled for Jan. 24 and Jan. 25 in the Luhr Building, 2nd floor. A longer announcement about the fair, including details on potential participation prizes, is in the works and will be published in Webster Today and on Webster University’s website in the coming weeks. Concrete pours for the floors are continuing through December 1. The Building Enclosure Mock up is being inspected and retested on November 8. The precast erection crane was fully erected Tuesday and is pulling precast spandrel (side) panels off the existing garage. For safety purposes, some parking spaces along the south half of the east side of the garage are temporarily blocked. They are expected to reopen after the Thanksgiving holiday. Truck traffic on Garden Ave will continue to be heavy. This week, the precast panels are being hauled off site, while rock and dirt is being delivered to the site. The rock and dirt is being used to build up the pad under the building. A large concrete pour on the north side of the building is scheduled for next week, which will cause some traffic delays. New precast panels also will be delivered, starting Monday morning. So far, the construction crews have completed 1,000 feet of drilling for the 40 drilled piers, removed 325 cubic yards of dirt and removed 175 cubic yards of rock. No work is scheduled for this weekend, which should bring some noise and traffic relief to the campus and nearby neighborhoods this weekend.